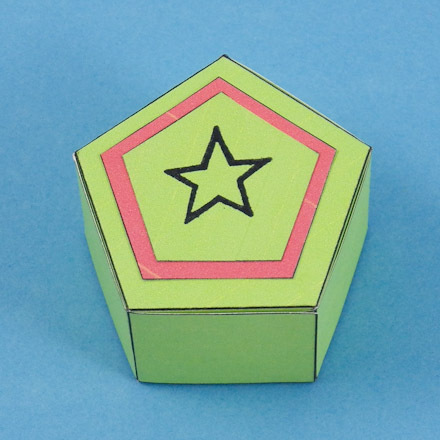 In this project, you will make five-sided boxes with pentagon-shaped top and bottom lids. The printable patterns are in various sizes with colored and black-and-white versions. The boxes nest together for storage, and can be used individually, or stacked. Use them as gift boxes, party favors, or for storing jewelry and other trinkets. 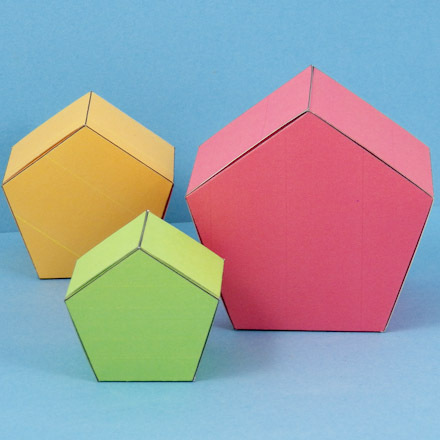 There are also bonus patterns for making tall, narrow pentagon boxes. 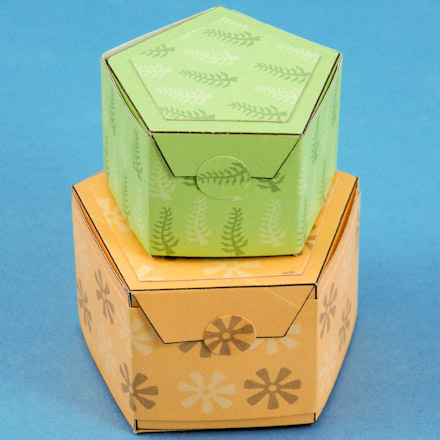 Make these cardstock boxes stronger by adhering decorative paper to the back of the printed cardstock pattern. You can further increase a box's durability by coating it with an acrylic varnish. Related craft: To make another style of pentagonal box, see the Pentagon Box craft project. Choose a box to make. Download and print the pattern. The single box patterns make 3" boxes and the patterns with two boxes result in 2" and 1 5/8" boxes. 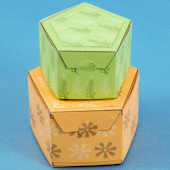 The bonus patterns make into tall, narrow boxes that are 2" by 5 3/8" tall. Cut out the box pattern on the solid black lines. Try to make the cuts very straight. The box will be stronger and fit together better if the cuts are straight. Turn the box pattern with the marked lines up. Score along each of the fold lines—red in this illustration. To score: On cardstock, use the bone folder or empty ballpoint pen to make an indent—not a cut. Fold lids and lid flaps on the fold lines. Flatten the box out again. Fold the glue tab on the black line, then flatten it. Fold each side on the black line, then flatten it. Cut a rectangular piece of decorative paper larger than the box pattern piece by ¼" to ½" all around. Center and glue to what will be the outside of the box. Fold the excess paper over and glue, or just trim away. Apply glue down the entire length of the glue tab. Shape the sides into a pentagonal shape and glue the tab to the inside of the last side. To finish the box, fold the bottom flaps in and tuck them in as you close the bottom lid. Repeat for the top lid. Decorate the box any way you like. 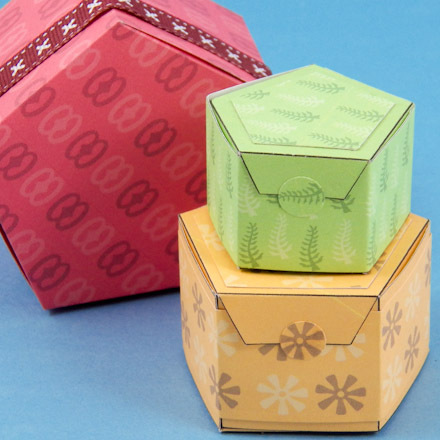 Adding cutouts works well; or enhance a plain box by gluing craft ribbon or paper ribbon cut from decorative paper in a band around the sides, or by lining the inside of the box. Your box is now complete! 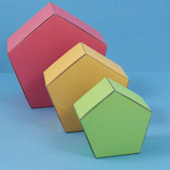 Tip: The Asante Tribe Symbols ePapers coordinate with the colors used for the boxes in this project. Print the ePaper on the reverse side of a box pattern, or use the ePaper to cut paper ribbons to glue on the box. Tip: Leave one of the box's lid flaps on the outside and seal the box closed with tape or a sticker made with a paper punch. 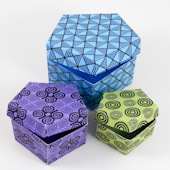 These boxes are wrapped with strips of Asante Tribe Symbols ePapers and pentagonal cutouts from the ePapers. 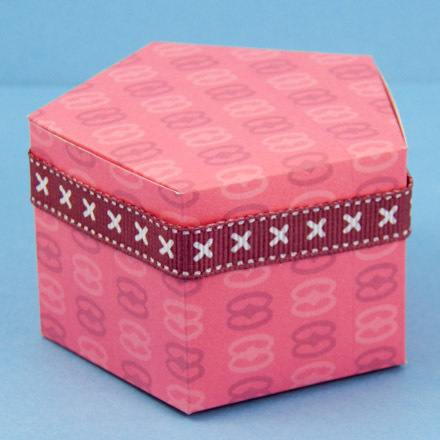 Tip: Decorate the box with ribbon trim. The Asante Tribe Symbols ePapers was printed on the reverse side of the box pattern..
Related project: To make a five-sided box with an overlapping lid, see the Pentagon Box craft project. Tip: The box patterns make graduated sizes of boxes. Tip: The top of the box can be decorated with layers of pentagon cutouts and then stamped.